2Measure the effect on outcomes, don’t measure outputs. Measure your results, not just numbers. A typical output measure might be the number of visitors to a website or participants in a program. 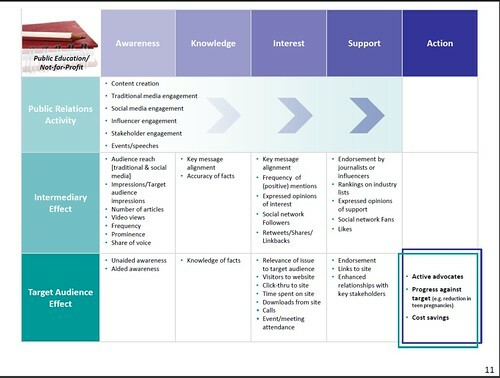 What should be measured are shifts in awareness, comprehension, attitude and behavior related to donations, purchase, branding, reputation, public policy, employee engagement and other shifts in audience beliefs or behaviors related to SMART objectives. 3Measure the effect on business results where possible. The confusion around whether or not you can measure social media has moved from “you can’t measure social media” to figuring out what to measure. 4Media measurement requires quantity and quality. This principle is about measuring both quantative and qualitative information. It’s more than just impressions — you should also look at measuring tone, relevance, message delivery and sentiment. 5Beware bogus metrics. AVE stands for “Advertising Value Equivalents” or as KD Paine likes to call it “Assessment By Voodoo Economics.” This is using bogus social media metrics to translate into some value. Geoff Livingston has a good post about the problems with this – using influence as the metric. 6Social media can and should be measured. Incorporate the discipline of measurement into your approach to go beyond just measuring “coverage” but also to measure conversation and communities. We’ve come a long way since the early days of social media in terms of measurement practice. 7Transparency and replicability are paramount to sound measurement. Measurement methods need to be shared as well as how specific metrics are calculated. 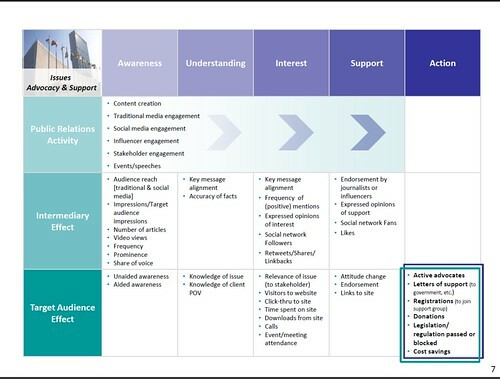 The Valid Metrics Framework was developed by AMEC to serve as a framework to identify possible metrics for measuring a communications program. These are simply guidelines to help think through what to measure – or what metrics will help your organization demonstrate progress toward an objective. The Valid Metrics Framework looks at communications in three phases with each consisting of specific metrics. The messages or story is created and shared: Metrics are related to the process of producing or sharing the desired message or story. The story is shared via an intermediary – journalists, bloggers, or influencers, with metrics reflecting the sharing of the message with the target audience. This article originally appeared at bethkanter.org and is released under a Creative Commons Attribution 3.0 license. Measuring social media success is more difficult than other forms of marketing.